Sit up straight in a chair or on the edge of a bed, with your hands resting behind your bottom. Next, extend your knee and hold this position. Now, pull your toes back and hold. Slump through the trunk, lowering your forehead to your knee for increased stretch. While Lying on your back, hold your knee and gently pull it up towards your chest. While lying on your back, hold your knee with your opposite hand and draw your knee up and over towards your opposite shoulder. While lying on your back with both knees bent, cross your affected leg over the other knee. Next, hold your unaffected thigh and pull it up towards your chest until a stretch is felt in the buttock. While kneeling, lean forward and bend your front knee until a stretch is felt along the front of the other hip / thigh (keep your bottom tucked in). While in a sitting position, bend your knees and place the bottom of your feet together. Next, slowly let your knees lower towards the floor until a stretch is felt in the inner thighs. While lying on your back with one knee bent, slowly lower your knee to the side as you stretch the inner thigh/hip area. In a standing position, cross the affected leg behind your unaffected leg. Next, with your arm over head, lean to the side (towards the unaffected leg). While seated, prop your foot up on another chair and allow gravity to stretch your knee towards a more straightened position. Lean on your thigh for a stronger stretch. Start by lying on your stomach with a belt / bed sheet looped around your affected side ankle. Next, use the belt to bend the knee until a stretch is felt. While in a sitting position, place a small hand towel under your heel. Next, loop a belt / towel around your foot and slide your foot towards your buttock. Hold a gentle stretch and then return back to original position. While lying down on your back holding a towel in both hands, hook the towel under your foot and raise your leg, straightening your knee until a stretch is felt. Loop a belt around your foot. While lying on your back lift the leg up keeping your knee straight. Now inwardly rotate the leg and bring across the midline, keeping your toes pulled back. While lying on your stomach, allow your leg to hang off the end of a table/bed. Position yourself so that your knee cap is just over the end of the table/bed. Add an ankle weight for increased stretch. While standing and leaning against a wall / table, place one foot back behind you and bend the front knee until a gentle stretch is felt at the back of the straight leg. While sitting, loop a towel around your foot. Gently pull your ankle back until a stretch is felt along the back of your lower leg. Bend your foot up and down at your ankle joint as shown. While sitting in a chair, cross your affected leg on top of the other as shown. Next, gently lean forward until a stretch is felt in the buttock region of the crossed leg. While lying on a table or high bed, let the affected leg lower towards the floor until a stretch is felt along the front of your thigh. Now, slowly bend your affected knee to add more stretch, grasping your opposite knee and pulling it towards your chest. In standing, place the front of your foot on a chair behind you. Slowly squat on your front leg, allowing your other knee to bend until a stretch is felt in the front of that thigh. Start by lying on your side with your back near the edge of the bed or table. Your affected leg should be uppermost. Next, let the top leg lower behind you as you maintain an extended knee as shown. While lying on your back, slowly bring your leg out to the side and hold. Keep your knee straight the entire time. Start in a standing position with feet spread wide apart. Next, slowly bend your knee to allow for a gentle stretch of the opposite inner thigh. In a standing position, cross the affected leg behind your unaffected leg. Push your hip out to the afected side and lean your trunk to the unaffected side. 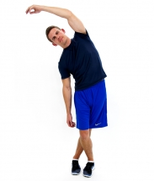 For a stronger stretch reach up and across with your arm (affected side). While in a standing position, bend your knee back behind and hold your ankle / foot to create a stretch in the front of the thigh. While lying on your back, raise up your leg and place both hands behind the the back of your knee until a stretch is felt. While seated, slide your heel towards your buttock with the assistance of the unaffected leg. Lying on your back with knees straight, slide the affected heel towards your buttock as you bend your knee. Hold a gentle stretch in this position and then return to start position. While in a seated position place your foot on top of a small towel. Then, slowly slide your foot closer towards you. Hold a gentle stretch and then return foot forward to original position. While standing and leaning against a wall, place one foot back behind you and bend the front knee until a gentle stretch is felt in the bent back leg / achilles. While sitting, loop a towel around your foot. Gently pull your ankle back until a stretch is felt along the back of your lower leg. Your knee should remain slightly bent during the stretch. Start by lying on your side with the affected ankle on top / off the edge of the bed or table. Next, move your foot upwards towards the ceiling and then lower as shown. While seated, cross your legs so that the affected leg is on top. Next, hold your foot and push downward until a stretch is felt along the inner side of your ankle. While seated, cross your legs so that the affected leg is on top. Next, hold your foot and pull upwards until a stretch is felt along the side of your ankle.